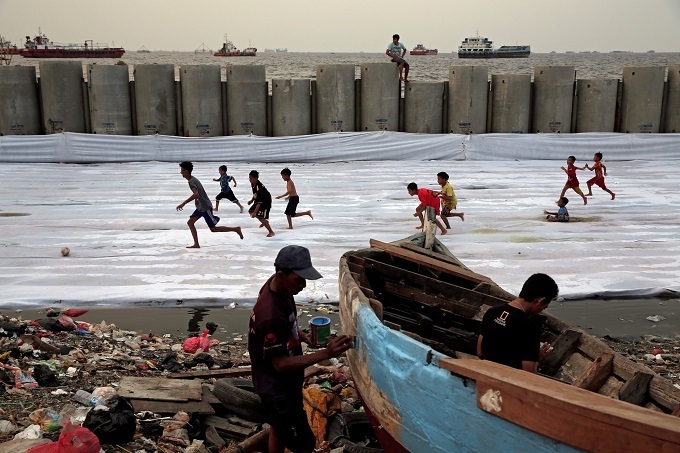 Children play soccer near breakwater at Cilincing area in Jakarta, Indonesia August 22, 2017. Photo by Reuters/Beawiharta. Millions of people in Indonesia, Mongolia and Thailand could be drinking unsafe water with long-term repercussions for their health and livelihood. In Mongolia, herders living outside the capital Ulaanbaatar, near the Tuul River, fear deteriorating water quality is making their livestock sick. In Indonesia, shrimp farmers in Serang who rely on the Ciujung River have seen their catches fall, and some have developed skin problems. In south-central Thailand, villagers near the Map Ta Phut Industrial Estate, home to petrochemical plants, oil refineries and coal-fired power stations, worry that their water is heavily polluted. Concerned about their health, these communities sought clarification and information from their governments about pollutants being released into the environment, overall water quality, the risks of using such water, and information on the companies thought to be responsible. In each case, they were thwarted, despite their countries having extensive legislation on citizens' right to information, including environmental data, said a new report by the World Resources Institute (WRI), a U.S.-based think tank. Villagers faced obstacles - from having to pay to access documents, to lacking an internet connection for online information, and needing to understand and use freedom of information laws, the report said. Sometimes, the data was unavailable publicly or presented in a language communities could not understand. When information was released, it was often poor, technical and did not meet local people's demands, said the report issued on Wednesday. "Access to information is really the foundation for any kind of meaningful public participation or accountability in environmental decision-making," Elizabeth Moses, the report's co-author, told the Thomson Reuters Foundation. In Thailand and Mongolia, people who request information are asked to come to the environment ministry to pick it up, even though some live hours away and do not have the money or time to travel, added the WRI specialist in water governance. Thai agencies may also refuse to release environmental information that is classified as secret. As a result, millions of people in Indonesia, Mongolia and Thailand could be drinking unsafe water with long-term repercussions for their health and livelihoods, Moses said. These problems reflect the struggles experienced by rural communities across the developing world who want information regarding clean water, she added. Globally, over 80 percent of all wastewater is discharged without treatment and contaminated water is a root cause of death, disease and disability, particularly in developing countries, according to the United Nations. "For the world's poorest people, access to clean water means fewer outbreaks of deadly diseases, less time spent away from the classroom by children collecting water, and greater economic opportunities for women," said the WRI report. Pollution also hampers economic progress. Inaction to tackle air and water pollution costs some countries the equivalent of 4 percent of GDP or more a year, the World Bank has said. While all three countries the WRI report focuses on have comprehensive laws to disclose information, many do not indicate how information is to be made available or comprehensible to affected communities, the report said. The Indonesian and Thai environment ministries did not respond to Thomson Reuters Foundation requests for comment. Erdenebulgan Luvsandorj, director of the water resources division at Mongolia's Ministry of Environment and Tourism, said anyone who wished to obtain water pollution data from the ministry or its laboratory was free to do so. The ministry will soon seek parliamentary approval for amendments to tighten up implementation of a 2012 law on fees for water pollution, he added. Local media say regulation has been too vague to effectively punish polluters. The WRI report urged the three governments to set up national systems to collect and publish environmental information. "Until local communities have the ability and the means to access the information they need, then these lofty goals around transparency are really not being fulfilled," said Moses. There have been some improvements, she noted. For example, Indonesia's Ministry of Environment and Forestry adopted a regulation in 2015 to expand the number of environmental documents it would proactively disclose, but it has yet to be fully implemented, she said.